How do you get him to tell you age of account? I have tried every option talking to him, can't seem to find it... Made my account sometime in 2003 not sure when though. gotta go to Hans in old school. Oh no wonder, I don't have osrs. 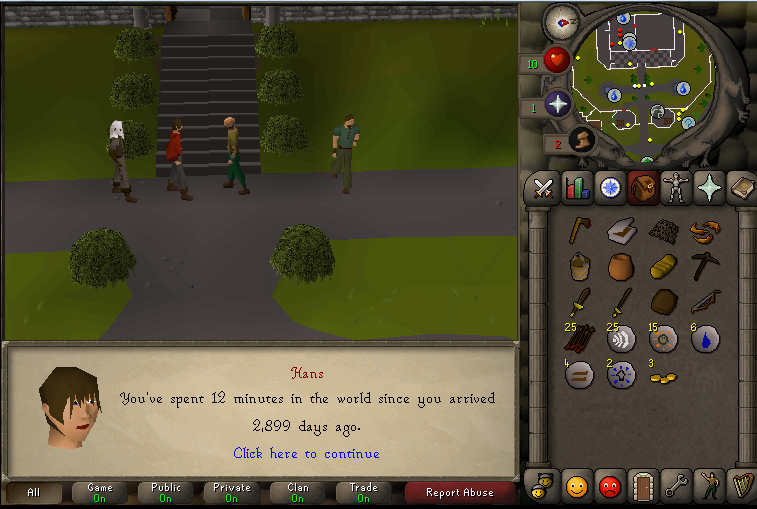 Guessing my acc was made in Sept/Oct 2003, making it approx 4,200 days old. Pretty whack. 3737 kinda thought it was older then that lol. Although I had an acc back in RSC just cant remember the info to check the age on that one. Runescape 3 - little over a year shy of 10 year vet. Old school - 17 total days played. My current account, Paradite, was created in late 2006 as one of many pures during my time, but I began RS some time in the spring/summer of 2002. I wonder if I can remember my old accounts Password, might as well go try Edit: Actually, this account below is technically not my first, I had another named "darthj" but I don't know how long I used that account for, I know I didn't level it very far though, perhaps 45ish combat lol. No way in the world I'll ever remember that accounts information, it was probably deleted long ago since the last time it was logged on was in classic haha. I gud memory. I finished classic with 80 combat, I could go on classic if I got this account members but bonds are too pricey right now for that lol. Edited by Blurple, 24 April 2015 - 11:33 PM. I'm getting my 10 year cape tonight on reset. That's 3652 days. My first account is ~2003 but that account is long gone. So on May 26, 2007 I signed up eh? Wow must've been a really long time. Btw, this is my first login to OSRS. Interesting, I didn't even know this was possible to see.